Would you pay for a Facebook vanity URL? As Facebook’s unbelievable growth continues unabated, the company is increasingly finding itself scrutinized by critics who are asking a simple question: ‘where’s the money‘? Even though Facebook is generating hundreds of millions of dollars in revenue, its costs are growing rapidly and there are various unsubstantiated rumors that the company is on a potentially disastrous financial path. Facebook’s primary business model, advertising, has been a mixed bag. Facebook ads have gained a reputation for less-than-satisfactory performance and its efforts to create more innovative and effective social ad platforms have been dented by user backlash. Advertising, however, isn’t Facebook’s only revenue stream. It has a multi-million dollar virtual gifts business, for instance, and it’s hard not to see the potential goldmine Facebook is sitting on. Now, the AllFacebook blog is reporting that Facebook is exploring the development of a new revenue stream: vanity URLs. Currently, profiles are located at non-descriptive URLs that Facebook assigns. Some celebrities, however, have been granted vanity URLS (eg. www.facebook.com/patricio) and AllFacebook reveals that Facebook has apparently been conducting polls asking users about their interest in the possibility of being able to pay for vanity URLs of their own. As AllFacebook notes, this could easily be a multi-million dollar business for Facebook and conceivably there’s millions more to be had by auctioning off generic vanity URLs that would appeal to businesses, like www.facebook.com/shoes. So is this a viable revenue generator and could it be a breakthrough for Facebook on the financial front? I have mixed feelings. While there’s definitely money here and there could be quite a bit of value for vanity URL buyers (SEO anyone? ), it’s hard to swallow the possibility that Facebook would build a 200m plus member social network only to monetize it by charging for vanity URLs. I don’t think it’s going to be Facebook’s AdWords so to speak, and even though I’m sure lots would pay, it’s worth pointing out that most other social networking services, like MySpace and Twitter, give away vanity URLs. Creating a two-class system where those who are willing to pay get to ‘create‘ their identity through a vanity URL and those who aren’t get stuck with a poor man’s URL might upset more users than we’d initially suspect. In my opinion, business models built around user expression need to be carefully crafted. Virtual gifts? Charge away if they’re an add-on to the core user experience. But when you start charging for the basics (vanity URLs, profile customizations) you run the risk of nickel-and-diming your users for functionality that they’ve come to expect as standard (and free) elsewhere. There has to be some compelling value. From a business perspective, it’s hard to tell whether Facebook’s potential interest in charging for vanity URLs is part of a smarter strategy (build up lots of low hanging fruit revenue streams) or whether it’s a sign of desperation (find revenue wherever we can). Photo credit: jaycameron via Flickr. eBay gets back to basics, will other companies do the same? 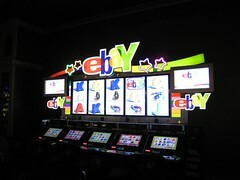 eBay, the online auction giant, is doing a bit of Spring cleaning. On Monday, it announced that it had sold StumbleUpon, a content discovery service it purchased for $75m in May 2007, back to its founders and a group of venture capitalists.